My little life changer – the Clover Yarn Cutter pendant! When I first saw a picture of the Clover Yarn Cutter Pendant, I knew it was destined to be mine! On our recent holiday, I got to the airport and had a quick rifle through my handbag for anything that might be restricted… and came out with 3 pairs of nail scissors, which I only had for yarn cutting purposes. Oops. While nail scissors are usually ok on flights (I think the blade has to be under a certain length), I have heard of some people having them removed at flight security so I wanted to make sure I was completely safe to continue my crochet on the road (well, in the air!). 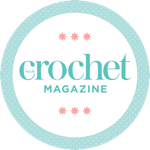 Also, when I carry nail scissors in my handbag, I tend to stab myself with them when I’m rummaging around, and injured hands are hard to crochet with – so something had to be done! I knew the Clover yarn cutter pendant was the answer to my woes as soon as I saw it. A round blade safely tucked away in an attractive pendant, it slices through yarn in seconds without the need to carry scissors. I seriously need to work on my keyring game… but the yarn cutter pendant works really well as a keyring! So far I’m really impressed with my yarn cutter keyring – it’s a nice cheap item which will make a real difference for me. Please note – this post does contain affiliate links, but the review is genuine and I paid for the item myself. Garden Craft Room – The Big Reveal! You know, I fly quite a bit, and I have never got one of these before, but they look SO useful! I’m totally getting one, thanks for the recommendation! great review! i used to always bring mine to the airport as well, thanks for the reminder !